Polyamines are low molecular weight aliphatic polycations, highly charged and ubiquitously present in all living cells. Interest has been increasing during the last 30 years in the naturally abundant polyamines putrescine (diamine), spermidine (triamine) and spermine (tetramine), which were demonstrated to be involved in a large number of cellular processes. 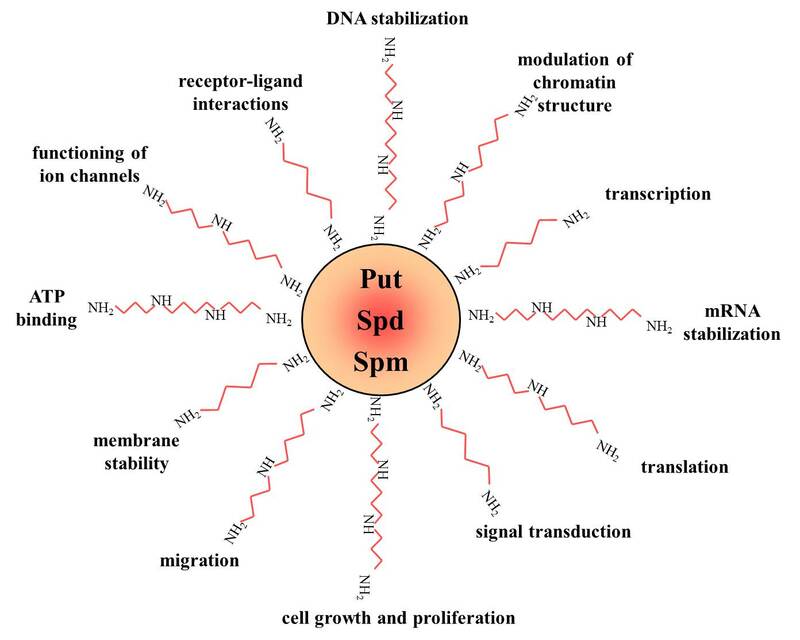 For example, polyamines participate in modulation of chromatin structure, gene transcription and translation, DNA stabilization, signal transduction, cell growth and proliferation, migration, membrane stability, functioning of ion channels and receptor-ligand interactions Polyamines seem to exert their role through ionic interactions, owing to their unique structural feature of regularly spaced positive charges. Inside the cell polyamines are present in nearly millimolar concentrations. There is equilibrium between polyamines that are bound to different polyanionic molecules (mainly DNA and RNA) and free polyamines. The free polyamine pool represents 7-10% of the total cellular polyamine content. Only the free intracellular polyamines are available for immediate cellular needsand therefore are subject to strict regulation. Polyamines are maintained within very narrow range because decrease in their concentrations inhibits cell proliferation while excess appears to be toxic. Therefore, the free polyamine pools are regulated in a very fast, sensitive and precise manner. This regulation is achieved at four levels: de novo synthesis, interconversion, terminal degradation and transport. Polyamine synthesis occurs in the cytoplasm of cells from all tissues. Polyamines are synthesized from two amino acids: L-methionine and L-ornithine (an amino acid that is not found in proteins, that is produced as part of the urea cycle). In mammalian cells, putrescine is formed by decarboxylation of ornithine, a reaction catalyzed by the enzyme ornithine decarboxylase (ODC). Ornithine is available from the plasma and can also be formed within the cell from arginine by the action of arginase. Synthesis of spermidine and spermine require the action of two enzymes: first, the S-adenosyl-methionine decarboxylase (AdoMetDC) for the synthesis of the aminopropyl donor; and second, a transferase enzyme (spermidine synthase or spermine synthase) which catalyze the transfer of the aminopropyl group to the primary amine groups of putrescine or spermidine, respectively. 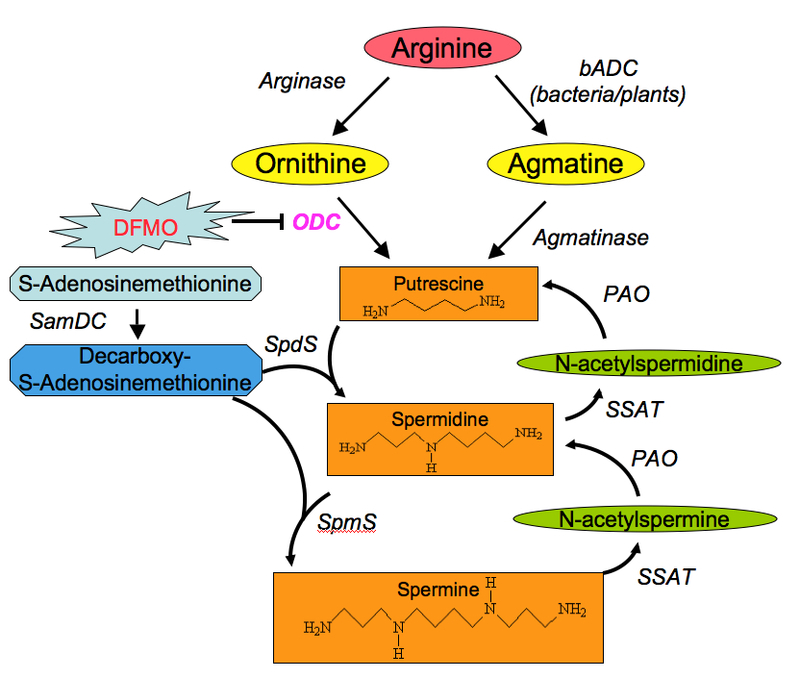 Spermine and spermidine are also regulated by the presence of a distinctive interconversion pathway, where they are acetylated (by spermidine/spermine acetyltransferase SSAT), and oxidized (by polyamine oxidase POA) back to putrescine. The third level of regulating polyamine metabolism is the terminal degradation of polyamines: oxidation of primary (terminal) amino groups produces polyamine derivatives that cannot be cycled back into polyamines. Polyamines are oxidized by variety of oxidases with different modes of action and co-factor requirements. In light of their fundamental significance, it is unsurprising that the intracellular level of polyamines has to be maintained within very narrow limits. Decreases of polyamine levels interfere with cell growth, leading to G1 arrest in S. cerevisiae and to embryonic lethality in mice. Abnormally high levels of polyamines appear to be toxic, causing apoptosis in mammalian cells. Polyamine content is increased in many cancers arising from epithelial tissues, such as skin and colon. The first and rate-limiting enzyme in the polyamine biosynthesis pathway is ornithine decarboxylase (ODC). ODC is tightly regulated, and one of the most rapidly degraded mammalian proteins, and its degradation is regulated by polyamines in a ubiquitin independent manner. This is achieved by a unique mechanism in which a polyamine-induced protein termed antizyme (Az) binds and inactivates ODC, and subsequently targets it to rapid ubiquitin-independent degradation by the 26S proteosome. Az was also demonstrated to regulate polyamine transport across the plasma membrane via a yet unknown mechanism. Az production requires a unique ribosomal +1 frameshift, which is stimulated by polyamines. 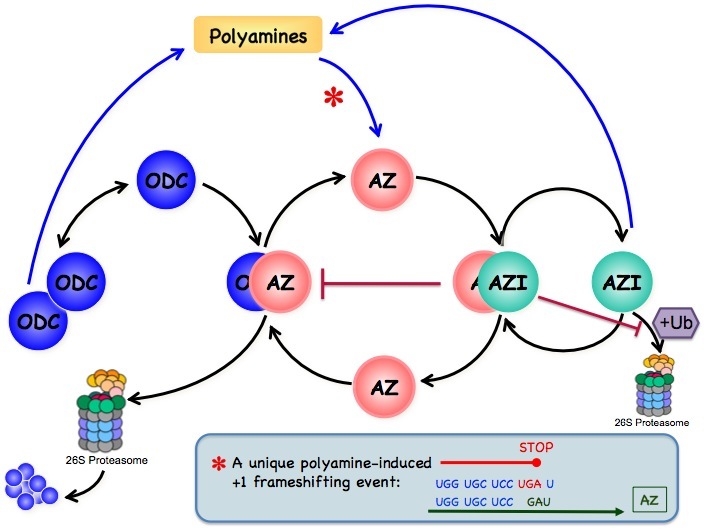 Taken together, Az synthesis and Az function constitute a feedback regulatory circuit maintaining polyamine homeostasis. Another protein relevant to the regulation of ODC and the cellular polyamine metabolism is a protein, termed antizyme inhibitor (AzI). AzI displays profound homology to ODC, but lacks ornithine decarboxylating activity. The affinity of Az to AzI was demonstrated to be higher than its affinity to ODC. Therefore, AzI can rescue ODC from its complex with Az, and prevent otherwise rapid degradation of ODC. Surprisingly, unlike the degradation of ODC, degradation of AzI is ubiquitin-dependant and inhibited by Az. ODC activity is induced during growth stimulation of quiescent cells. and is constitutively increased in cells transformed by oncogenes, treated with carcinogens, infected by viruses, and in a variety of malignancies. Normal cell growth is regulated in a cyclical manner by increase and/or decrease in specific proteins and protein kinases known as cyclins and cyclin-dependent kinases (cdks). ODC and polyamine concentrations also change during the cell cycle; There is an early peak of ODC at G1-phase, followed by an increase in polyamine content, and a latter, second increase during G2-phase and prior to mitosis. Therefore, both polyamines and cyclin/cdks show phased changes through the cell cycle, but the interaction between these two sets of regulatory molecules remains to be defined. It is therefore not surprising that depletion of intracellular polyamine pool results in growth arrest. The arrest point varies with the type of polyamine-biosynthesis enzyme being inhibited and the drug used. For example, inhibition of ODC with its specific inhibitor DFMO results in a G1-phase block. Polyamine depletion induces MAPK pathway and elevates the stress-regulated kinase (JNK) activity. Increased MAPK/JNK induces p53 tumor suppressor protein, which in turn may increase the transcription of p21, inhibiting cdk and causing accumulation of the hypophosphorylated form of the retinoblastoma protein. As polyamines are tightly correlated with regulation of cellular growth, there has been an increasing effort over the past years to link polyamine metabolism to cancer. Increased polyamine levels are coupled with increased cell proliferation, decreased apoptosis and increased expression of genes associated with tumor invasion and metastasis, thus making their metabolism a target for cancer treatment and prevention. However, numerous studies presenting evidence on the involvement of polyamines in modulation of cellular transcriptional responses are mostly sporadic, addressing specific notions and describing particular processes to be affected. Thus, generalized approach to the question of transcriptional regulation by polyamines is required to understand the mechanisms by which cells modify gene expression in adjustment to variation in polyamine levels.